I have been catching up with summer cookbooks reading and found those 2 recipes which I think would work well together. You will need a 27cm × 23cm ovenproof dish for this recipe. Preheat oven to 180C. Sift flour and baking powder together in a bowl, then stir in oregano and 1 tsp salt. Make a well in the centre and add eggs, 80ml (1/3 cup) oil, milk and cold water. Using a whisk, stir to combine then beat until mixture becomes a smooth, thick batter. Drizzle remaining 1 tbs oil over base of a 27cm × 23cm ovenproof dish and pour batter over the top. Crumble feta over batter and then scatter over oregano sprigs. Bake for 50 minutes or until golden and bubbling. Cut into pieces and serve still warm, drizzled with extra virgin olive oil. I used a glass dish (23cm × 30 cm). It makes a thin bread. And I used dried oregano leaves because I didn’t have any dried Greek oregano sprigs. Nice taste, easy to make and I will freeze it. You could serve it plain but it would be nice with a selection of dips. It serves 6. The other recipe, CHUNKY CAPSICUM DIP, comes from The Australian Women’s Weekly “Christmas and holiday entertaining” cookbook. Blend or process ingredients until well combined, but not completely smooth. Season with salt and pepper. Make sure you use fresh cashews (otherwise it will give an old taste to the dip) and add salt and pepper. And I added about 300g extra capsicum. To me, the original quantity was not enough. I also added Sriracha sauce to the dip (hot chilli sauce) to make it more tasty for me. I got about 2 × 230ml jars of dip. Keep refrigerated. 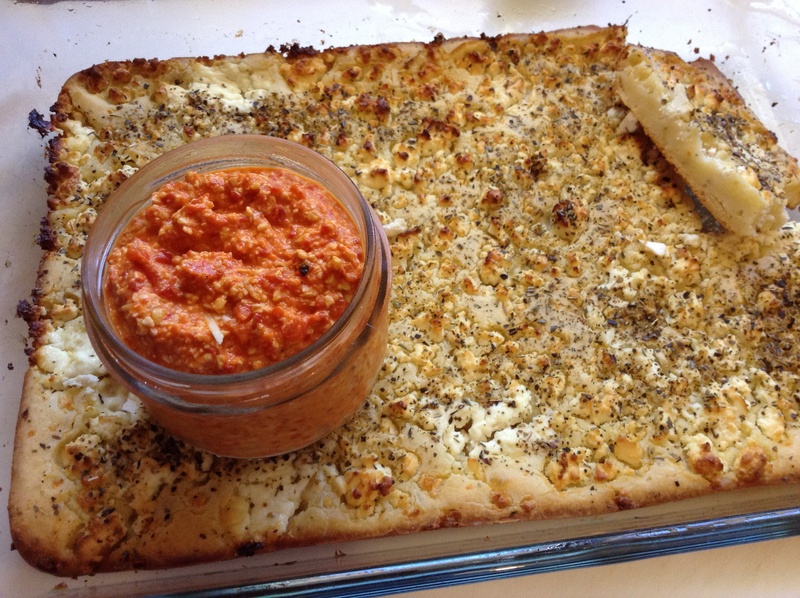 So, morning tea today was greek feta pie and dip. Yummy!